You need to decide who you are targeting on twitter. Is it to expand your business or to network with other counsellors/health professionals/therapists etc.? If you are using it to expand your business or to promote mental health then you need to think carefully about who you are going to attract and how you will use it. Remember it is a public profile. Anyone can see it. Do you want your clients to follow you? If the answer is yes, then you need to think about what you tweet. If you are using it as an opportunity to network with other counsellors then should you keep self-promoting yourself? I have two different twitter accounts. One that I network with other counsellors and people who live in my area and second one for anyone interested in mental health. The second account (@ucangrow) is the one that I link to all my other social media. If you want to your tweets to be private then protect your account. Only follow people that interest you. As you start to follow people you will notice that their tweets will provide you with links to websites, quotes and photos of topics that you may wish to share. If you retweet someone’s article, make sure you include that person twitter name in your tweet. Remember to credit everything you share. If you don’t like what people post then just unfollow them. If you find anyone is offensive then you can block them. Interact with people and share information. If you are going to sell your service then it should only be 10% of what you tweet. Keep a professional outlook. Do not swear. Be honest. Do not engage in any counselling with anyone. Don’t get hung up on the number of followers or expect anything from your followers if you do not interact with them. Some people choose to thank those who retweet them. I don’t think this is essential and can be time consuming. Engage with other counsellors. Praise them if they inspire you. If they chat to you, answer back. Let’s learn from each other. If you are attending Continuing Professional Development then let people know. Tweet valuable comments. Promote the organisers. Always respect your colleagues. Don’t talk about people in a negative way. 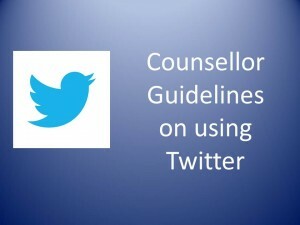 If you are using twitter as a professional counselling account then do not post too much information about your personal life. Your clients or potential clients may look at your twitter account. You would not put a photo of your family in your counselling room so why would you do this on twitter? Don’t tweet things you would not say to people’s faces. Always remember twitter is public. Do not engage in therapeutic work on social media as this will compromise your client’s confidentiality and it is not ethical. Don’t tweet anything you have not read. Always read anything you tweet or retweet. Don’t direct message people selling your services. Don’t worry or get upset if people don’t respond. Twitter is fast moving. Just try again. Do not discuss any client material on your tweets. I am active on twitter and I have made some new friends, networked with great colleagues, increased my reading and learnt loads about mental health and counselling related issues. I would say twitter is fun. Have a go. If you have any further recommendations or questions on these ethical guidelines then please comment below.